Thursday, Apr 25, 2019, 12:30 – 1:20 p.m.
Leonardo Trasande, MD, MPP is an internationally renowned leader in children’s environmental health. His research focuses on identifying the role of environmental exposures in childhood obesity and cardiovascular risks, and documenting the economic costs for policy makers of failing to prevent diseases of environmental origin in children proactively. He also holds appointments in the Wagner School of Public Service and NYU’s College of Global Public Health. He is perhaps best known for a series of studies published in Lancet Diabetes and Endocrinology and the Journal of Clinical Endocrinology and Metabolism that document disease costs due to endocrine disrupting chemicals in the US and Europe of $340 billion and €163 billion annually, respectively. Dr. Trasande leads one of 35 centers across the country as part of the National Institute of Health’s Environmental Influences on Child Health Outcomes program. He is leveraging the NYU Children’s Health and Environment Study as well as another birth cohort to examine phthalates, bisphenols, organophosphate pesticides and polycyclic aromatic hydrocarbons and their effects on fetal as well as postnatal growth and early cardiovascular and renal risks. These two cohorts are part of a larger initiative nationally to identify preventable and environmental factors that influence child health and disease. He is Principal Investigator on numerous other NIH-funded projects. These include a study on prenatal and childhood phthalate and bisphenol exposures in Generation R (a Dutch birth cohort) to examine obesity and cardiovascular risks, as well as another project studying the effect of these dietary contaminants in children with chronic kidney disease, with the hypothesis that these exposures create oxidant stress and accelerate disease progression. He is also Principal Investigator for a research project comparing neurodevelopment, cardiometabolic and respiratory profiles of children exposed in utero to the World Trade Center disaster to a comparison group. He has served as a member of numerous scientific committees and expert panels, including: the American Academy of Pediatrics’ Executive Committee of the Council for Environmental Health; the Science and Technical Advisory Committee for the World Trade Center Health Program; the National Children’s Study Methodological Review Panel of the National Academy of Sciences; the United Nations Environment Programme Steering Committee on a Global Outlook for Chemicals; and the Board of Scientific Counselors for the National Center for Environmental Health at the Centers for Disease Control and Prevention (CDC). After receiving his bachelor, medical and public policy degrees from Harvard, he completed the Boston Combined Residency in Pediatrics and a legislative fellowship in the Office of Senator Hillary Rodham Clinton. 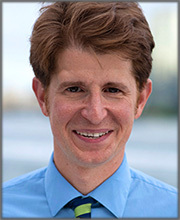 Prior to coming to NYU, he completed fellowship training in environmental pediatrics. For five years he also was a Lead Investigator in one of the original (Vanguard) locations of the National Children's Study, and Deputy Director for the largest (eight location) Study Center spanning a region from upstate New York to central New Jersey.